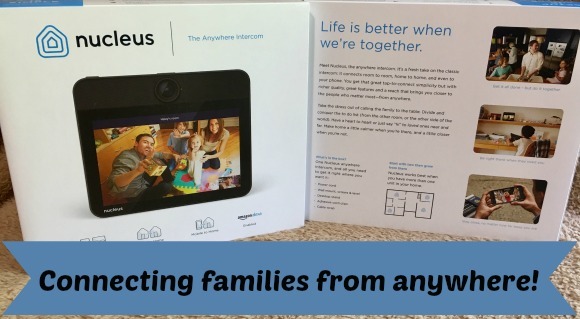 Stacy Tilton Reviews: Nucleus: Connecting families from anywhere! Nucleus: Connecting families from anywhere! Have you ever really stopped and thought about all of the new technology that fills our lives these days? I know I sure have. I can remember when I was a teenager how cool I thought I was with my first cell phone. They hadn't been out very long so they were pretty big, and there wasn't a whole lot you could do with them. Fast-forward to present day and now there's actually not very much your phone can't do for you. I will say some technology I feel would have been better off having never been discovered because it's made us lazy when it comes to basic tasks that we can now program our phones to control. However some technology has really been a great benefit to our lives. Take for instance the Nucleus Wi-Fi Intercom. Through the awesome advancements of technology you can talk and see family members in different rooms of the same house, house to house, or mobile to house with an app. Yes I know you can Facetime but not everyone has come into the smartphone stage. Take for instance my in-laws, they have a cell phone but don't use it for anything but calls and texts. And they live several states away so my kids only get to see their grandparents once a year. And that's where Nucleus is going to change our lives! We have a Nucleus unit at home connected to our wi-fi and I'm going to send one of the units out to them to set up on their home wi-fi. Then the kids can not only talk to them, they can also SEE them at the same time! It will be super awesome for my daughter to be able to finally share projects from school with her grandparents in living color instead of having to just describe them over the phone. You can connect as many Nucleus units as you like between family members which is awesome if you ask me. Of course you don't have to use them to connect with people outside of your home. As I mentioned before you can use them in different rooms of the same house. This is great for me because the boys spend a lot of time working in the garage so I will be able to quickly see and talk to them if they need me to bring something down to them. The part I'm really excited about is by using the app on my phone I can check in on a room of my house at any time day or night. I like this because there are times when I can't make it home before my daughter gets off the bus. With this unit I can watch for her to arrive, and she can also let me know she's home safe. Set-up is very straightforward and everything you need is right in the box. Simple - which is what I like! After you're set up and ready to go I suggest testing it out with others in your home so everyone is familiar with how it works. It can really be a great and useful tool to have in your home. 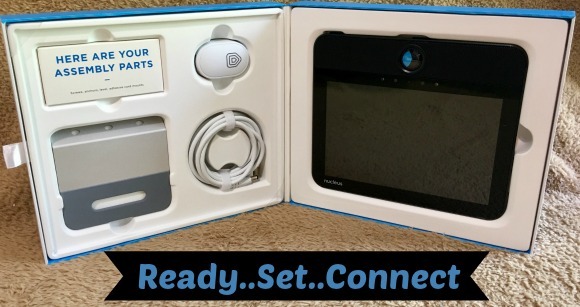 Plus it has bonus features like the ability to play music, control smart devices, start a call, all with your voice. It's even the first touch-screen device with Amazon Alexa. In case you're wondering, I have a Nucleus unit in my kitchen to use when I'm cooking. I can tell it to play music, or answer incoming calls from the family all through the use of my voice hands-free! Have you ever wondered about ways that technology keeps you safe? Check out this handy graphic with lots of great ways! After reading through it myself I've really come to be thankful for how far we've come in this day and age! That looks like a really cool gadget to have.